It started as a joke as so many mad ideas do. 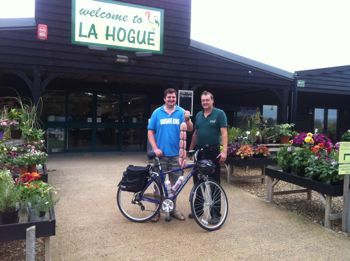 Chris, the owner of La Hogue farm shop near Newmarket said I would never make it all the way to the farm shop on my bike (50 miles). He was so confident that I couldn’t do it he said if I did he would personally cook me the biggest breakfast I had ever seen. How hard can it be I thought to myself? 100 miles can’t be that much more taxing than the 50 and 60 mile bike trips I’d been doing. In order to arrive near breakfast time I needed to leave very early. I wanted to leave a good margin for error and set myself the target of arriving before 10am. I left home just before 5am which I thought would give me lots of time. My thoughts were with the bacon and eggs which awaited me as I slipped silently through the early morning air. After a cold start the weather was on my side for a while as I followed route 30 from Diss to Hopton and then eventually picked up route 13 into Bury and then route 51 towards Newmarket. At Barrow the heavens opened and I started to contemplate the merits of cycling 100 miles just to eat breakfast. Spurred on by the familiarity of the villages and the impending sense of achievement I somehow made it in just over 4 hours. I always enjoy visiting La Hogue as I think they have a lovely selection of local produce and are totally committed to the local economy and food. Their top selling crisps, for example, come from just down the road at corkers. Chris greeted me with a steaming cup of fresh coffee and it provided the perfect tonic to speeding up my recovery. I think I was slightly in shock as to how well it had all gone. As I warmed up and relaxed with a second cup of excellent coffee I could hear Chris preparing things in the kitchen but I wasn’t allowed in. I thought I heard them mention they would need a bigger plate and my mind boggled as I sat and read the paper. When Chris brought out my breakfast I was astonished. This was the biggest breakfast I had ever seen but how on earth could I do it justice. I had just burnt 3500 calories and didn’t really want to replace them all in one meal! Luckily for me it turned out it was a bit of a wind up and Chris got out a plate for himself and shared the breakfast with me. The quality of the ingredients in the breakfast were second to none. Lovely free range eggs, breakfast sausages made on the premises, local bacon, local black pudding and crunchy but fluffy hash browns. It really was incredible. I often find that breakfast sausages can be lacking but not so with the La Hogue breakfast sausage. This is a meaty and bold creation, made on the premises with local ingredients, and really adds to the breakfast. 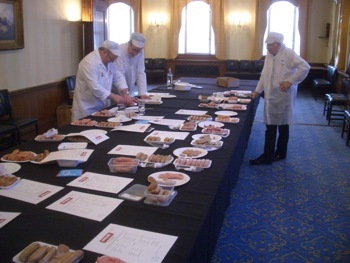 The sausage can easily be part of team breakfast but equally could stand on it’s own as the feature of another dish. 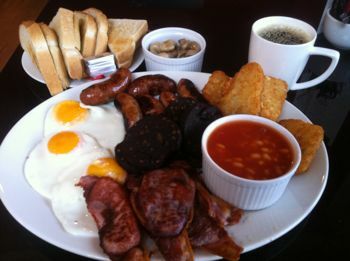 After such a cracking breakfast and a third cup of coffee I was worried I might be too heavy for the bike but it seemed to cope far better than me on the return journey. Around 75 miles is when it started to bite mentally and I found myself just dazing a little after stopping to change water bottles over. I managed to pull myself together and get on with it and made it home in about twenty minutes longer than the outward journey. It’s a long way to cycle for a breakfast but what a breakfast it was with top quality locally sourced ingredients. I envy those nearer who can cycle every weekend and visit. You must have been stuffed! !